Growing strawberries in your garden gives you delicious fruit that everybody loves. Learn how to grow big beautiful strawberries by following these simple guidelines. It’s especially important to prepare the soil properly before you plant your strawberries. Strawberries are a perennial and come up year after year. It’s more difficult to change the soil environment after the plants are established. See Types of Soil. If your soil isn’t light and loamy, there are a few things you can do to quickly help change the soil condition. Vermiculite – This is used to aid in the water holding capacity of the soil. Peat Moss – This is organic matter that helps to aerate the soil. This is also a great fertilizer. Till these soil conditioners into the soil to a depth of 6-8 inches along with a liberal about of organic sulfur (needed in western alkali soils) and 16-16-16 fertilizer. This will give your growing strawberry plants good soil in which to grow. In the past, we’ve had some frustration growing strawberries successfully. We’ve always had good plants but very few nice big strawberries. Someone pointed out that we were growing the wrong variety for our area. That one suggestion made all the difference. Check with your local county agent to see which strawberry varieties produce good berries and grow best in your area. In Utah Valley the varieties that produce the best strawberries are: Albion and Diamonte. You’ll start planting strawberries in the early spring (middle of March or 1st part of April). It keeps people from walking on the plants and compacting the soil. The strawberries are confined and don’t spread to other parts of the garden. It keeps the special soil mixture that’s just been created contained. The netting can be tacked down to the wood that’s around the edges. Most strawberries come bare root. This means there isn’t dirt around the roots. You’ll usually pay more for strawberries that are planted in potting soil. Dig a hole. 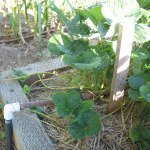 Place your bare root strawberry plants in the hole so that the crown (this is where the root stops and the stem starts) is at soil level. Spread the roots out evenly and cover them with soil. Plant a strawberry patch that’s five feet wide. This way you can reach the plants from both sides of the patch. The strawberry plants should be spaced one foot apart from each other – going both directions. 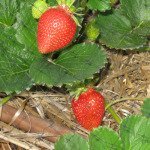 During the winter, it's a good idea to spread straw over the top of growing strawberries to protect them. The straw will also serve as a good ground cover and will keep the berries from lying directly on the soil. This will help prevent insect damage and keep the strawberries from rotting. 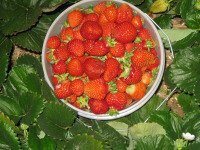 When the plants are getting established the first year, the growing strawberries will not produce as many berries as they will the second and third years. Keep them watered so the ground is moist throughout the growing season. See Garden Watering Systems. Also keep the strawberry patch weeded. See Garden Weeds. As the growing strawberry plants begin to take root, they will produce large leaves and beautiful white flowers. The flowers will develop into berries. Phosphate is an essential nutrient that is needed for fruit production. You can encourage the growth of the fruit by adding a mixture of soluble phosphate to the growing strawberry plants. Pour a little of this mixture around the base of each plant. 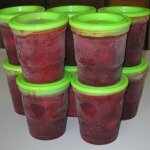 You can buy strawberry food or make your own soluble phosphate. Here’s how to make your own: dissolve Triple Super Phosphate (0-45-0) in water and add a little nitrogen. Strawberries spread by sending out runners from each plant. It’s important to remove these strawberry runners as they develop. You do this so that the strength of the plant is producing strawberries rather than new plants. This needs to be done every week or two. 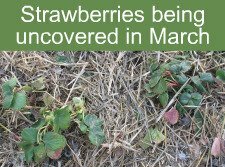 If you don’t keep these strawberry runners under control, the plants will get root bound, and the berries will be small. You should get many beautiful strawberries the first year and many more the second. 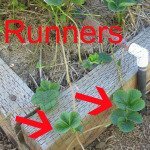 If some of the strawberry plants die or you want to expand your strawberry patch, you can let some of these new runners take root and form new plants. 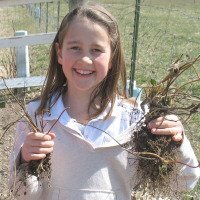 Once a root system has developed, cut the new strawberry plants away from the mother plant. Transplant the new growing strawberries to the new location. It’s best to let these strawberry runners take root later in the season so that you can still enjoy an abundant harvest of berries during the summer. Remember birds like red ripe strawberries. They usually peck a hole in them about a day or two before you want to pick them. 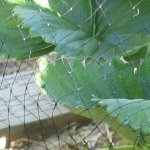 Put bird netting over the strawberry patch to discourage the birds from getting their meal before you get yours. You can use wooden stakes in the soil every 4-5 feet to hold the netting up off the plants. Holding the netting up off the plants makes it more difficult for the birds to get to the strawberries. Using the wooded stakes also holds the netting high enough to prevent the new growing strawberry plants from getting intertwined in the netting. You can tack the netting down every 4-5 feet. Just reach up under the netting to pick your growing strawberries. 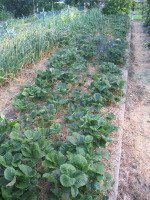 At the end of the year before the first hard freeze, you should cover the strawberry plants with 4-6 inches of straw. Then place some type of mesh covering on top of the straw. This holds the straw in place so the wind doesn’t blow the straw off the plants. The straw will help protect the established strawberry plants during the winter. Some of this straw can remain the next spring to serve as ground covering. See Planting Strawberries. 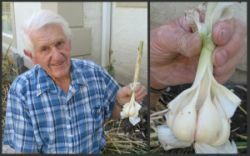 Each year you should add some fertilizer to the soil to help keep the soil fertile. We were thrilled at the difference in our strawberries when we grew the right variety using this process. The strawberry jam you can make with these berries is something to write home about.